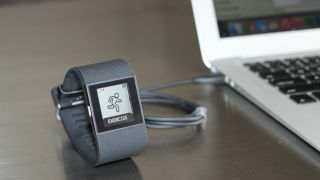 The Fitbit Surge is receiving several updates this week that should improve its functionality. At $250 (£200, AU$350), the Surge is already Fitbit's most powerful fitness wearable with GPS tracking, real-time workout stats and a heart rate monitor. With the update, you'll see extended GPS battery life allowing you to run, bike and hike longer while tracking heart rate and routes. Previously only able to last five hours, the battery should be doubled to around 10 - depending on usage. A new feature called Run Cues will help runners monitor training on the track, the treadmill or the road with automatic alerts saying when a predetermined time or distance during the run has been reached. A timer and stopwatch have also been added. We'll be updating the review shortly to test out these new features.